This one I am most proud to take the blame for!!!!!!!!!!!!!!! That's not entirely true, I have LOTS of words, but some of them might be deemed offensive, even if those ARE the first things that I say when utterly amazed. Which I am. Now someone has to write the stories for the premier issue. This is by far the most ridiculously brilliant manip ever. I now want this magazine. Liek whoa! Still staring at this - and Matty and Minion have the same scruff thing going on. 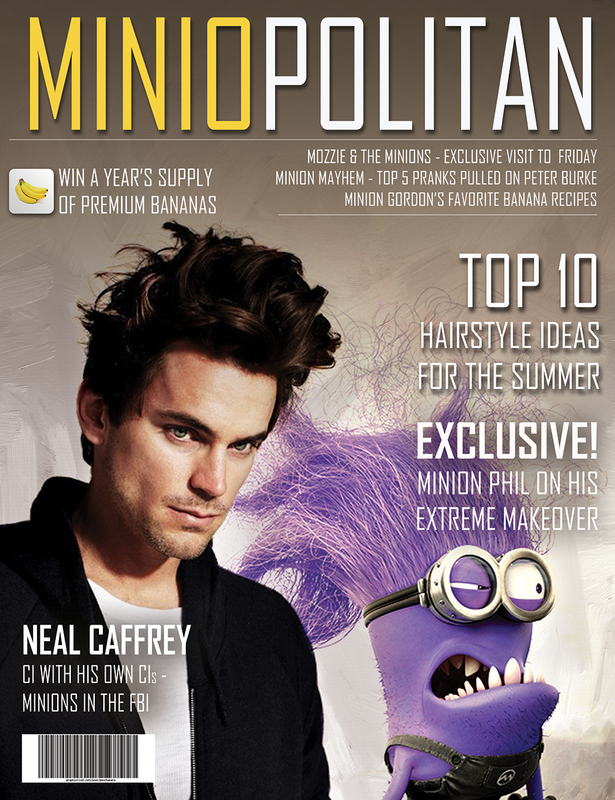 Now someone needs to write a fic about Mozzie, Minions and 5 pranks pulled on Peter...! I swear I keep thinking you can't get better and then you go and do it again! I do hope Elr gets one to him, I imagine his kids would enjoy it considerably! ROTF! Another awesome minion manip! You always know how to make me smile, and sometimes even LOL in the middle of the office. I don't think there are enough words to describe how much I love this!!!! This is epically amazing!!!!!! Adore the pic, you are brilliant. Matt reaction is so cute.